PDFaid is an online service that provides PDF Image Extractor to extract images from pdf and helps to save them in jpg, gif, png, or in bmp format. You can download all the extracted images in a zip file. You need to follow three simple steps to extract images from pdf. You can use PDF Image Extractor to extract images from pdf file (maximum 20 MB size) without any sign up process. Another good thing about this pdf image extractor is that images are saved in true colors and in original resolution. But you will be able to extract only 20 images. You need to upgrade to paid registration to extract all the images. Above screenshot shows main interface of PDF Image Extractor where you need to perform only three steps to extract images from pdf. 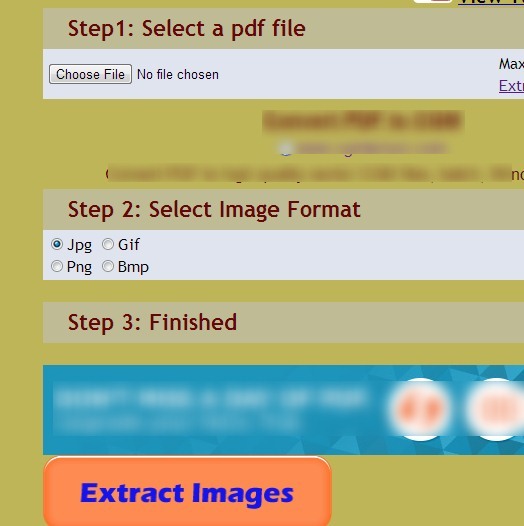 Upload a pdf file (single page or multipage) and select the output format for extracting images. After this, hit Extract Images button and it will start extracting process. With a short delay, it will extract images from pdf which you can download as a zip file using available link. This online PDF Image Extractor is quite useful if you have a pdf file containing maximum 20 images. In that case, you will be able to get all the images. Otherwise, you need to upgrade if you want to extract all the images. Or else, you can try these online services and software to extract all the images from a pdf file for free: Extract PDF Images, ExtractPDF.com, and Fusion PDF Image Extractor. It’s a handy online service that can extract images from pdf without any sign up or email registration process. You can select the output image format accordingly. Supported output image formats are jpg, gif, png, and bmp. Three easy steps are needed to extract images from pdf. It is free to use for everyone. PDF Image Extractor provided by PDFaid is a nice service to extract images from pdf. But as it can extract only 20 images so it will be beneficial only if you have a pdf file having less than or equal to 20 images. Use PDF Image Extractor free. We have also reviewed free software to extract text from pdf files: PDF Text Extractor, PDF2Text Pilot, and Free Easy PDF To Word Converter.